While picking up your item of choice from a store is a fun experience, waiting in the check out line just to buy one small item take the fun out of it. I prefer to shop online. Also, now that I’m living outside the country, shopping online is my only option for sending gifts to family. Online shopping has opened a new door to customers like us. Even in India there are now quite a handful of websites offering online shopping options. Most of them are offering various types of items from home goods to electronics. When I came across MagicKart.in I felt like a kid in a candy shop, especially because of the fact that this website is dedicated to kitchen items and table ware. I love shopping kitchen items, and serve wares. MagicKart.in has a wide range of kitchen items and the prices are pretty competitive. The homepage is plain and simple, and browsing through the website is very easy, you’ll find just the right item for you. And, the best part is they have an online chatting service with the support team. I tried it out, and they are very prompt. Magickart was started by a team of three enthusiastic people, and their work shows up on the site. Such a big collection of kitchen appliances and cookware is really hard to find online in India and even in stores. So if you are searching for something to gift your loved one this festive season, MagicKart is the right option. With gas prices sky rocketing in India, its time to change the traditional way of cooking on gas ovens. Induction cookers are the next big thing in the Indian kitchen. MagicKart has a a variety of induction cookwares. The flat bottom cookwares are easy to use on the induction ovens and even on the traditional gas stoves. The prices are pretty competitive and they have a collection of the most trusted names in cookwares from Nirlep, Hawkins and Prestige. I am fond of baking, and when I clicked on the bakeware section on the website, I was struck with awe. The different type of molds they have for baking are worth spending a few bucks on. I especially liked the tulip mold bakeware. It looks so pretty, I just cant wait to bake in it. With Christmas nearing, I’m sure you’ll find the right bakeware to make your family happy at the Christmas table. If you are a newly wed, I feel MagicKart is your one stop solution to setting up your new kitchen. 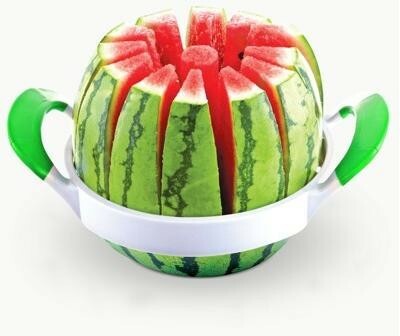 The website offer a huge range of kitchen utensils, starting from the most used knives and coconut scrapers to the very innovative yet very useful water melon slicer and banana guard. After my wedding, the most challenging part in the kitchen was making roti. I am sure most of you have the same problem, the easiest solution is the roti maker, its simple, and without any hassle. MagicKart has a lot of other kitchen related items too. The 5 piece thali set is just the right item to gift your loved one, to tell you the truth, I have already added it to cart. Browsing through the website was really fun, and I almost wanted to throw away everything in my kitchen and buy a new set from MagicKart. Right now, they are having a sale on quite a few items, so hurry and make your kitchen dream come true. You can also check MagicKart’s Facebook, Twitter, G+ page and blog pages.